Many years ago, when Apple’s idea of a smartphone was the Rokr and the company wasn’t yet racking in billions of dollars by the bucketful, a friend of mine came to me with a rather unique problem: The plastic screen of his iPod classic—back then, still just “an iPod”—had melted. A few pointed questions revealed that this was actually my friend’s second iPod; having grown frustrated with the scratches on the front plate of his first unit, he decided to pawn the latter off to his teenage daughter, buy a new one, and use a bit of clear packing tap as a makeshift cover to protect the music player’s screen from being damaged. Eventually, the tape, too, got scratched; to boot, when my friend tried peeling it off, it left a nasty residue that resisted every cleaning fluid he would throw at it—until he tried paint thinner, and ended up with an iPod that would have looked perfectly at home in a Salvador Dalí painting. I helped him find a reputable repair shop, and, after a few stern words of warning, he was back in business with a brand new aftermarket screen plate. As it turns out, the problem of plastic screens getting too easily damaged was, at the time, on the mind of another man—none other than Steve Jobs. As Apple was readying its plans for the launch of the first-generation iPhone, Jobs realized that a phone would spend most of its time jiggling around its users’ pockets alongside keys and change, all of which would, in short order, turn a plastic screen into an unreadable mess of dents and scratches. The original iPod, as well as most of the models that followed it, used plastic to cover the screen. Readily available and easy to manufacture in just about any shape, plastic is so versatile that it’s become the material of choice for all kinds of mass-produced electronics, from wall clocks to portable music players. Plastic is also very flexible and tends to bend, rather than break, when subjected to the abuses of everyday life. This same flexibility is also its Achilles heel. On the Mohs Scale, which is used to measure the hardness of materials, the most commonly used polycarbonates clock in at a meager value of three, about as hard as copper, but three times softer than iron or nickel, both of which are materials you are likely to find, in the form of coins and keys, in a person’s pocket. Jobs knew that to avoid scratches Apple would have to turn to glass, a material that is, in many ways, the opposite of plastic. Its relatively high hardness translates into much better scratch resistance, but at the cost of much lower flexibility. At Mohs values that reach as high as six, a glass-plated screen can easily survive alongside other trinkets in a pocket, but will shatter in a hundred pieces when subjected to the slightest bump or fall. This problem is traditionally solved by making glass thicker, or—ironically—interleaving it with panes of plastic, as is the case, for example, with most modern car windshields. This approach, however, wouldn’t help much in the case of a smartphone, since nobody would presumably want to carry around (or buy) a device protected by a one-inch pane of heavy glass. As told in Walter Isaacson’s biography, Jobs’s quest for an iPhone-worthy glass took him all the way to Corning, a small city of 12,000 in south-central New York state that was named after the railroad tycoon who funded most of its original development in the 1800s—and is also home to a Fortune 500 glass manufacturer that shares its name. Corning (the company) knew a thing a thing or two about making glass tough. It had built the windows for the Space Shuttle, and spent decades researching and developing special glass that would retain high degrees of strength even when laid out in thin sheets for applications like car racing and aerospace manufacturing, where weight comes at a premium. At Corning, Jobs found—and eventually convinced CEO Wendell Weeks to mass produce—a material that the company had dubbed “Gorilla glass.” As clear as plate glass, Gorilla sported a higher Mohs value and much better strength, making it perfect for Apple’s upcoming family of smartphones. Corning’s Gorilla Glass is chemically treated to be more flexible—and less prone to breakage—than traditional glass. Gorilla glass begins its life with a composition that is similar to regular glass: A brew that includes aluminum, silicon, oxygen, and alkali like sodium is melted together into a substance that lacks a specific overall structure—what chemists call an amorphous solid. This is then cooled and floated into sheets of arbitrary thickness. Unlike regular glass, however, Gorilla undergoes a further chemical process, during which it is submerged in potassium nitrate—a salt that you may better know as one of the compounds that give bacon its pink color and keep it from spoiling into a cesspool of harmful bacteria intent on destroying humanity. This is no ordinary brine, however: The nitrate is heated to more than 300 degrees Celsius, at which point it melts. When the plain glass comes into contact with the molten salt, a process known as ion exchange causes the sodium ions inside the glass to be replaced by the potassium in the nitrate. 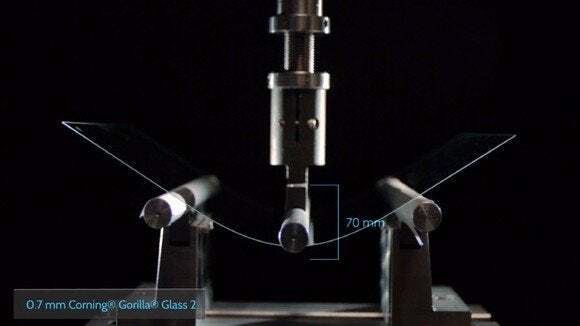 Because potassium atoms are much bigger than their sodium counterparts, when the glass cools down again, they push harder against each other, creating a layer of compression stress in the finished material that helps prevent cracks from forming, thus making Gorilla glass more shock resistant while retaining the imperviousness to scratches that makes glass screens more desirable than those made of plastic. Since the introduction of the iPhone, Corning has made a number of improvements to Gorilla glass, which Apple reportedly still uses in today’s devices. The third version of the material, for example, was designed with a process that models its composition down to the atomic level, and results, according to Corning, in more than three times more resistance to damage than the original. While natural sapphire is often colored by impurities, its pure, industrial counterpart is transparent—just like glass. 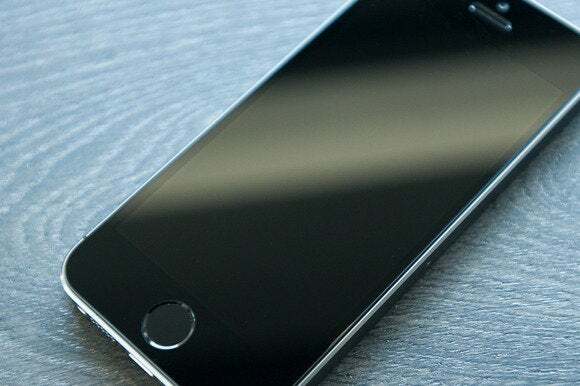 Still, if you own an iPhone, iPod touch, or iPad, chances are that cracks and scratches are still very much on your mind—which, perhaps, explains the healthy number of cases and screen protectors that are widely available from third-party manufacturers. If you’re like me, you may have even taken to carrying your phone in a dedicated pocket, cramming your change and house keys in the other just so that the two don’t accidentally come into contact. It’s likely that this fact hasn’t escaped Apple’s design team, either, which may have led the company to look beyond glass and into the manufacture of a different medium for its screens: sapphire. Although its name may evoke the image of beautiful blue gemstones—the color is the result of iron and titanium impurities—pure sapphire is actually transparent, and an excellent conductor of all the wavelengths that make up visible light. Made primarily of aluminium and oxygen molecules arranged in a crystalline structure called corundum, it sports a Mohs value of nine, making it the third-hardest known material after diamonds and an exotic mineral called moissanite—both of which are far too expensive for use in a mass-market product. Alas, Apple can’t go mining “natural” sapphires big enough to cover an entire iPhone screen—even if they did exist, they would likely present any number of defects and impurities that would make them completely unsuitable for mass production. Instead, Apple has built a facility in Arizona that will allow the company to manufacture synthetic sapphires; although the exact process used by Apple isn’t known, sapphire production usually involves either “growing” it from a seed crystal (a technique for which the company already owns a patent), or forming it by subjecting its base components—aluminium and oxygen—to extremely high pressure from all sides until they coalesce into the finished material. 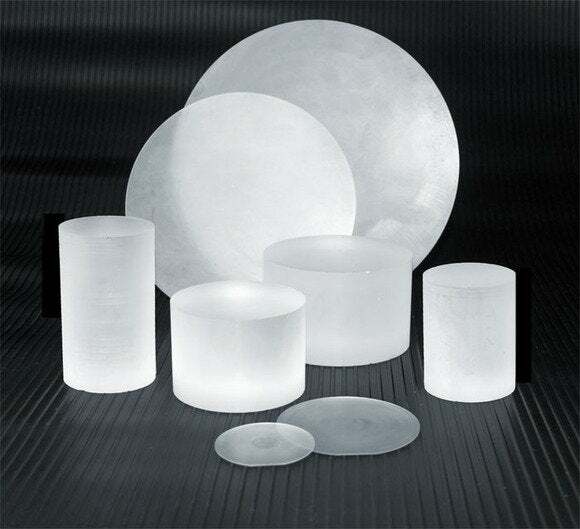 Once machined, synthetic sapphire is virtually indistinguishable from glass—but much stronger and less prone to scratches and cracks. Interestingly, sapphire is actually heavier than Gorilla glass—given two panes of the same thickness and size, the former will weigh roughly sixty percent more than the latter. However, because of its higher strength, one needs far less sapphire, which could make devices that use it both lighter and thinner. Sapphire is already widely used in a number of common applications; for example, the front plates of many high-end watches are made with it, and even Apple has been employing it to cover the camera lens of recent iPhone and iPad models, as well as the Touch ID sensor on the iPhone 5s. As a material, it adapts without problems to industrial automation and its characteristics have been widely researched. Still, it’s too early to say whether the fine folks from Cupertino will switch to all-sapphire screens for any of the models in the iPhone’s sixth generation; certainly, there are a number of indicators that the company is, at the very least, investing heavily in the gemstone: In addition to the aforementioned factory, Apple has filed a number of patents that cover everything from sandwiching glass and sapphire together—a combination that would give future devices the protection of the latter at a fraction of the price—to covering a sapphire screen with a special oleophobic coating that repels fingerprints and smudges. Leaks and early reports notwithstanding, we will likely have to wait until the official launch of the iPhone 6, which is widely expected to happen sometime this fall, to find out whether gemstone screens are in our future. Until then, we’ll just have to continue to be extra careful whenever we pocket our phone or lay it down on a flat surface—or suffer the, uh, scratchy consequences.